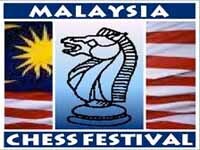 First congratulations are in order to Hamid and his team for managing to again do a Malaysian Chess Festival and I think that any activity is a good thing and that the response shown in increased participation is due reward. While the various supporting events are going from strength to strength, the original Malaysian Open is clearly diminishing, be it in the quality of local representation (lack along competitiveness) and even the foreign entries are not what it used to be. There are many reasons and some obvious solutions but I appreciate how hard and difficult it is to organise and it is easy to criticise when you have not done it and while I have, a public forum is not always the place to provide feedback no matter how well intended. So, well done guys and I sincerely hope it continues on next year because what I can say here is that the money to do it was not anything like what we understood from previous years so I ask our local chess community to start stepping forward now to start to make a difference.